Well, we've been in Kalgoorlie, western Australia for 11 days now. I started work last Tuesday which hasn't given me much time to sort general life stuff out so things will take a while to settle down. We are currently in temporary accommodation in a fully serviced unit for 4 weeks, until we find a place to rent. Which is not easy. The rental market is very tight here so I have to be on the ball investigating each property that comes onto the market. Thanks to Andy's new interest in motorbikes and a Suzuki in the crate on its way, we need to find somewhere with a secure garage or shed which adds another dimension to the search. Actually it probably would be fairly easy if it weren't for that. The biggest demand seems to be for family homes and I don't want anything too big as I invariably end up making a mess - the bigger the house the bigger the mess! At the weekend I did manage to finish a tack order, believe it or not. I had pre-cut and dyed the parts for a classic scale bridle to go with the brown saddle from the last post. So since nothing here happens on a Sunday I was able to get on with that and finish it. The whole set will be jetting off to Germany at the weekend. It is pictured above on my Equorum Norman Cob, known as Rowanoak. Poor Rowanoak missed the boat and had to be packed in my very full suitcase. Good job she's slightly bendy and not a resin! For those of you that are interested she has a customised neck and alpaca mane and tail, which is beautifully soft. I didn't get a chance to finish the Australian set. More on that in the next post. I completed this a week or so ago but it's taken me a while to get around to posting about it. A lovely customer Stacy ordered this for her OF and CM Newsworthy models. She gave me quite a free rein, only stipulating that she wanted it in dark brown. The saddle is made with my new style tree with a square cantle; the tree had to be fairly wide as Newsworthy is a fairly chunky pony! The flaps have a standard knee roll which is hand-stitched for longevity. I'm really pleased with the girth and the optional stud-guard - it just fits in front of the pony's stand. The bridle is pretty neat, it's not raised but has slimline padding and a flash attachment. All the fastenings onto the bit are stud-hooks so the bit can be changed, and I even made latex martingale and rein stops in blue to match the over-reach boots and saddlecloth. Finally I tried something new out for the front tendon boots. The straps just have slits in which fit over studs, and then the keeper is niftily threaded through and overall looks pretty neat. I lined them with thin pliver, they didn't need anything else. Great news as on the 26th of March Stacy took the set to a live show where it picked up a blue ribbon and NAN qualification. Well done Stacy! I was recently asked by Helen Moore of Equorum to develop a line of tack suitable for her handmade latex horses and ponies. I was very flattered to be asked and set about making up some examples sets that we could sell via her website. 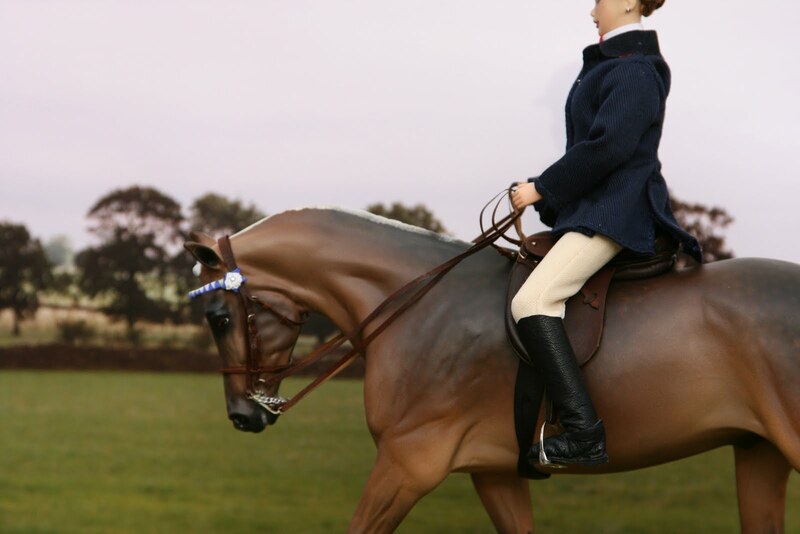 You can buy from an ever expanding range of pose-able horse and pony breeds, riders and accessories. I think they're adorable and my collection is growing month by month. They make a lovely antidote for the frustration that can often come along with trying to create super-realistic set-ups, using fragile artist resins and delicate tack! 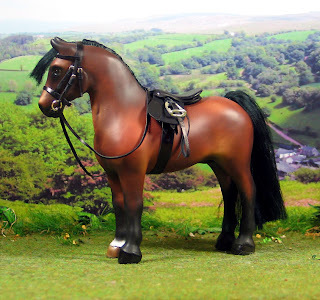 Plus, more and more shows in the UK are having dedicated divisions for handmade/craft type models which I think is fantastic as they are all very much a part of our model horse heritage. 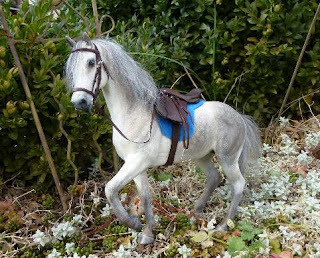 I started off with one of the smallest in the Equorum range, the Shetland Pony, pictured below. I made a pony pad with suede seat and knee rolls. The girth and stirrup buckles work with tongues whereas the bridle has slip buckles. The set is not as detailed as my normal hobby tack but we needed to keep both costs and production time down. Next I tackled the Connemara, one of my favourite moulds. For this one I made a more conventional General Purpose saddle with knee rolls. The bridle has buckles with tongues for added realism. On my workbench right now I am making a set to fit the Show Hunter Pony and a side-saddle for the Connemara. 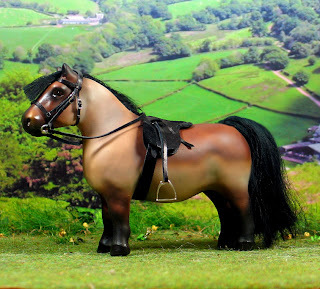 Next up will be new prototypes for the Welsh B pony, the Welsh Cob and the Trakehner, and these sets will be available to buy from the Load The Lorry page in a few weeks. Longer term I hope to develop other styles, such as dressage sets, cross country and polo sets. It makes a really refreshing change to make simpler tack and not be so obsessed with the finer detail. I think many of these sets could be shown with success as the tack is user-friendly and has all the right proportions. That post title is a little odd, but I've found a glue brand that really works! In the past I've used various glues and I've had most success with Contact type glues. 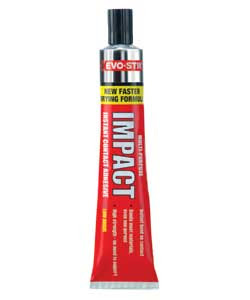 This new one is Evo-Stik Impact glue. It isn't too messy, cleans up well, and sticks leather really well (and instantly, no standing around holding things together!). It is also flexible so the finished tack doesn't end up feeling stiff and brittle. I have decided that I hate Duco Cement. I bought a couple of tubes from Rio Rondo last year and have been trying it out. I find it really stiff and brittle, and doesn't seem to like some types of leather. It also makes a horrid mess and is a nightmare to get off leather. I tried it because I thought that's what everyone else uses, but now I honestly don't know why people use it. I can really recommend the Evo-Stik, off to buy a load more this weekend!